Today we see hateful speech wherein some people describe the scholars of the Salafi da’wah as being harsh and going overboard. These accusations come from those who refrain from speaking in the face of bid’ah and its people, who are easy-going with the affairs of bid’ah, and are liberal with the callers to innovation or at the least are silent concerning them. They describe the shaikhs of Salafiyyah as being harsh! What is their harshness? In which affair are they harsh? The truth is that: it is they who are harsh! They remain silent concerning the Ikhwānī, the Tablīghī, the Ash’arī, the Sūfī, the ‘Aqlānī modernist and he’ll remain silent concerning everyone – he lives with them peacefully because “that is from hikmah (wisdom)” in his view. He conceals this evil conduct behind the screen of hikmah so that the children of the Muslims fall into loss and misguidance. Hikmah in actuality, is to put something in its rightful place. So harshness is correct when the Religion calls for it, and gentleness is correct when the Religion calls for it. The Prophet (salallāhu ‘alaihi wassallam) said, “Allah is Kind and Gentle and He loves gentleness in every affair.” This is not hidden from us – since that is the origin in da’wah. Allah said, “By Mercy from Allah, O Muhammad, you were lenient and gentle with them. And if you had been rude in speech and harsh in heart, they would have scattered from about you. So pardon them and seek forgiveness for them and consult them in matters. And when you have decided, then rely upon Allah. Indeed, Allah loves those who rely upon Him.” He (the Most High) commanded the Messenger with this. That is the origin. So the mumayyi’ wishes to accommodate ahlul-bid’ah, he does not want to be angry with the falsifiers of the truth – and the result of that is the misguidance of the youth of Ahlus-Sunnah wal-Jamā’ah, those who may take his behaviour as an example to follow. So if this person of falsehood comes forth then what is our response? It is to call him, advise him, and explain to him the truth and then if he refuses? Then Allah stated (in answer): “O Prophet, strive against the unbelievers and the hypocrites and overpower them.” Ahlus-Sunnah use this verse regarding the overpowering of the hypocrites to also apply to ahlul-bid’ah and the people of desires because they have the traits of the hypocrites. The danger that is posed by ahlul-bid’ah against the people of Islam is greater than the danger posed by the open unbelievers. These are principles established with the great scholars of the Sunnah. And the dangers posed to ahlus-Sunnah by those mumayyi’īn (those who mix and are easy going with ahlul-bid’ah) is more severe than the open and manifest ahlul-bid’ah. We know ahlul-bid’ah and we warn against them by Allah’s permission. As for the one who makes excuses for them and makes allowances for them then this one is a danger to ahlus-Sunnah. We say: Between you and us are the books of Sunnah that are established with authenticity and if you find the Salafis opposing even a single word from what is found in them, bring it to us. I will narrate to you something from those narrations in this matter, even though the mumayyi’ūn today who are easy going with bid’ah and the innovators, do not like that the likes of this be narrated. The following is taken from volume one of the voluminous work of Al-Lālikā’ī (rahimahullāh) where he makes mention of the ‘Aqīdah (the creed) of the Rāziyain, Abu Hātim and Abu Zur’ah. Then he moves on to state what is found in the ‘Aqīdah of Abu Hātim (rahimahullāh), so he writes, “The warning of Ahlul-Hadīth was-Sunnah from Al-Karābīsī.” This Karābīsī was a major well-known jurist and scholar. Then he wrote his book in Tadlīs (the concealing of deficiency in a chain of narration to give the impression that the isnād is sound) he mentioned the names of Mudallisīn (those who hide deficiencies in the chains of narration). The book was presented to Imām Ahmad, and it contained errors, so Imām Ahmad spoke against it. So when it was said to Al-Karābīsī that the book reached Imam Ahmad and he spoke against it, and he requested from you to retract your errors. Al-Karābīsī refused, but that he had said: “Take it to Abu Abdillāh (Ahmad Ibn Hanbal) for he is a righteous man who has been guided to good.” So the book was presented to Imam Ahmad and he refuted it and warned against Al-Karābīsī and warned from sitting with him. Abu Hātim makes clear his warning against Al-Karābīsī and warning from whoever defends him such as Dāwūd Ibn ‘Ali Al-Asbahānī, who is the imām of the Dhāhiriyyah (the literalist madhdhab) and had a great standing with the scholars. Dāwūd Ibn ‘Ali came to Imam Ahmad and Imam Ahmad refused to host him or to meet him. Abu Hātim spoke against Dāwūd Ibn ‘Ali with very severe speech because of his defence of Al-Karābīsī. And likewise, when Al-Karābīsī heard the speech of Ahmad Ibn Hanbal, he because haughty and started to criticise Ahmad. Dāwūd Ibn ‘Ali defended Al-Karābīsī and made excuses for him. Ahmad turned him away and did not host him or agree to meet him. Abu Hātim warned against him, and many of the scholars of the era spoke against him. So what station do these people today hold as compared to those of the past? So those who seek to be easy-going and accommodating regarding the affair of the innovators and the misguided deviants, then it is imperative that they are warned against. One must hold fast to the authentic Sunnah of the Messenger (salallāhu ‘alaihi wassallam) and follow the straight, clear and steadfast path which Allah’s Messenger left us upon – and the path his Companions (radiyallāhu ‘anhum), and the Tābi’ūn, and then those who followed them precisely such from the Imāms of Hadīth (radiyallāhu ‘anhum): Az-Zuhrī, the two Sufyāns, Mālik, and their likes, Hasan, Ibn Sīrīn, Ayūb, Ibn Asbāt, the two Hammād’s, Wakī’, Ibrāhīm, ‘Alqamah, Ahmad, Al-Bukhārī, Muslim, Abu Dāwūd, At-Tirmidhī, Ibn Mājah and others similar to them – for it was these men that preserved and guarded the Sunnah, and through them Allah preserved and guarded the narrations of the Companions (radiyallāhu ‘anhum). So who is there today of the calibre of ‘Ali Al-Madīnī or Dāwūd Ibn ‘Ali (may Allah’s mercy be upon these two imāms), such that the opposers seek to defend him? 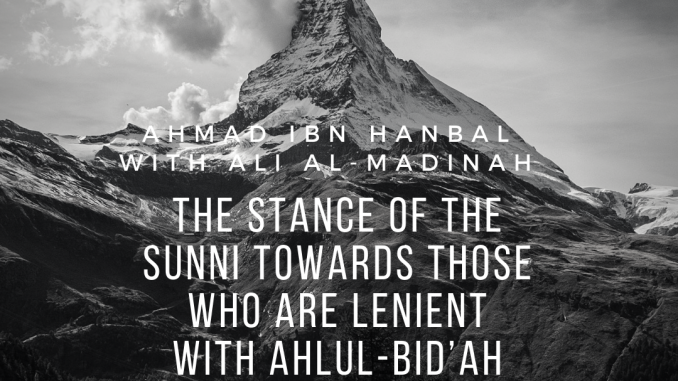 Alongside the great and immense knowledge of ‘Ali Al-Madīnī (rahimahullāh), Imam Ahmad still refuted him, and boycotted him due to his nearness to an innovator and his criticism of the scholars of Sunnah. Imām Ahmad, Abu Hatim and other great scholars kept away from and warned against ‘Ali Al-Madīnī, and Dawud Ibn ‘Ali due to the latter’s praise of Al-Karābīsī. So where are these mumayi’ah today who think they are permitted to defend callers to innovation, misguidance and deviation – and they expect Ahlus-Sunnah to remain silent whilst they harbour and defend ahlul-Bid’ah. When these fundamentals and principles of Salafiyyah are violated and opposed by those who give honour to the innovators, and praise them – yet simultaneously they find fault with Ahlus-Sunnah, their scholars and their books, then Ahlus-Sunnah cannot remain silent in the face of this falsehood and treachery.